Ah, the puppy. It’s an impossibly cute creature. Just think about it for a second. That fluffy fur covers their entire body. They have those giant puppy dog eyes and the squishy wet nose that bumps you as they try to sniff you. They squirm about on the ground, making yapping noises. They stumble after toy balls. And have you ever seen a puppy chase after its own tail? Puppies are almost too good for this world. All of it just melts your heart in an instant. Of course, your infant is also impossibly cute. Your little one might not be covered in fur and maybe they don’t go around yapping like a pup, but your baby has no problem melting peoples’ hearts. But what if we told you that there was a way to combine the cuteness of a puppy, with the cuteness of your child. It’s totally possible with this infant puppy costume! 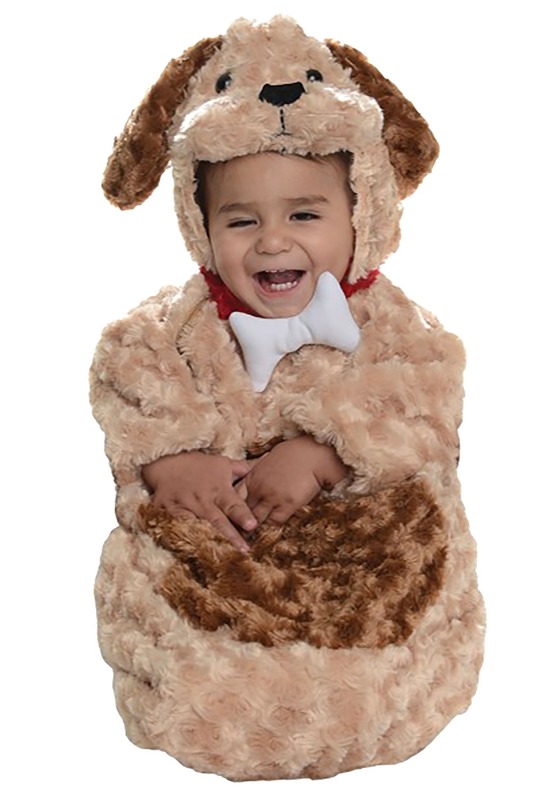 Now your child can be the most adorable baby ever with this infant puppy costume. It comes with a bunting style outfit that’s covered in ultra-soft, tan faux fur material. It has a big round brown spot in the center of the outfit. It also comes with a headpiece with plenty of puppy features! The floppy brown ears dangle from each side and a pair of big, black puppy eyes is on top. It has a generous opening for your baby’s face, so everyone will be able to see their shining smile while all dressed up as a puppy! Your baby will be ready for their very first Halloween or costume party when you outfit them in this adorable puppy costume! Just beware of the immeasurable level of cuteness that your baby will attain in it! You might not be able to stop yourself from snuggling with them all day though.